In case you were wondering, Frank N. Stein is not a love story. Not that you will ever wonder. But just in case you picked up a copy of NJ artist Edward Dippolito’s grim comic book expecting a heartwarming romance, you will be shot down immediately with the series’ sarcastic tag line. You could just as easily need warning about the terrifying demons that will swirl around the pages. Complete with haunting artwork and surprisingly philosophical questions about life’s scariest battles, Frank N. Stein is definitely a series to keep your eye on. Imagine you woke up one morning to find yourself partially transformed into a grotesque version of yourself. You look in the mirror to find a gaping eye socket missing an actual eye, lifeless flesh sagging off your skeleton, and other terrifying oddities you can’t explain. Sounds like someone had a rough night there, eh? I don’t think that even my most heavy-duty concealer could mask the warped features we find poor old Frank N. Stein suffering from. Detailed pencilwork and eerie shadowing bring Frank and his demons to life in a monstrous way. Not only is bewildered Frank unable to explain how or why his body is literally disintegrating and melting away, he also can’t make sense of where exactly he is. And there are horrible creatures coming after him, hell-bent on taking him down. How and why did he get this way? Is he destined to be a monster only made of human parts, picking up the Frankenstein reference? Who are the ghoulish creatures that have an undeniable — and so far, unexplainable — beef with him? And why are all of the logical plot turns coming from a talking cat? 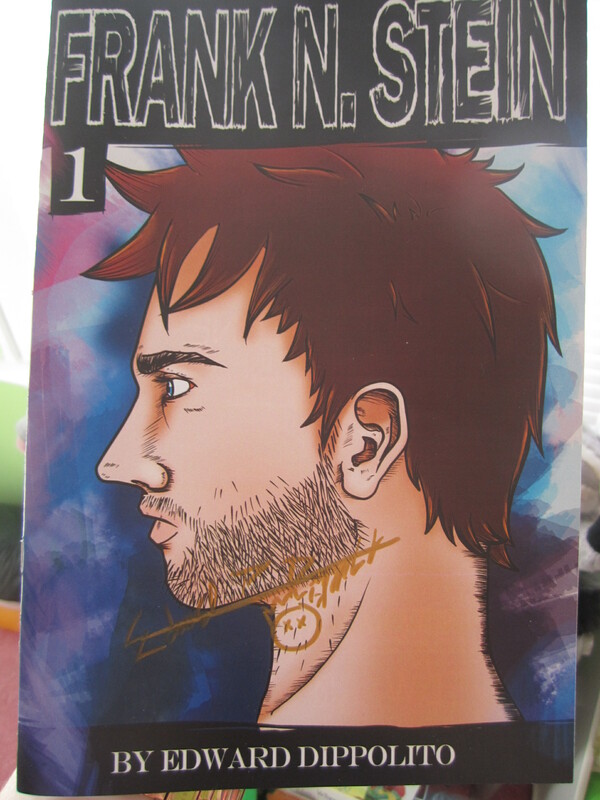 In the first issue, subtitled “Rebirth,” we trace Frank’s literal and philosophical awakening. Even as Frank awakes to the scary, gross world around him, we realize that sometimes the most frightening part of any given day (or life, as a whole) can be facing the terrifying unknown — even the personal unknown that is coming from within. Morbid and dark, this series makes us wonder which direction Frank will take — will he wander aimlessly through his new life, barely escaping the demons chasing him down? Or will he fight against the darkness, regaining a sense of control? Sound like the questions you want answered? Be sure to check out Frank N. Stein and Edward Dippolito’s other work here. You can download a copy of Frank N. Stein on your e-reader too, if you’re into that kind of thing.